My favorite chair is one next to the large window overlooking a dozen flower pots and three bird feeders. 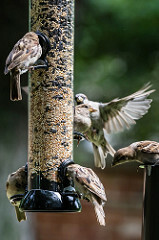 At least twenty different species visit those feeders, and I love getting to know them and learning their behaviors. the stubborn bird that keeps bashing his head against my window, fighting off the “competitor” he sees reflected there. Neither he nor his equally persistent rival will give up the fight until they’re too exhausted to go on. that huge black bib and the red cheek splotch and all those polka dots! learning that flicker’s tongue wraps around his brain to cushion it when he’s pounding on a tree (or a roof) – how wonderful is that? the memory of the flicker who cost me $110 a couple of years ago. He wanted the neighborhood ladies to understand his sexiness, and his pounding on my home’s metal roof vents sent reverberations throughout the house exhaust system. Unfortunately, that was before I had a Ficker jewelry box, and I didn’t yet understand flicker habits, so I called in a heating repairman to see what was “wrong” with my propane furnace and my propane fireplace log, and why were they making that odd unpredictable noise! Yesterday I had a close encounter with a hummingbird. Unbeknownst to me this hummer flew into my garage as I was backing my car out. Several hours later I drove back into the garage and found him, exhausted, fluttering weakly against the inside of the garage window, frantic to get out. Hummingbird feet can only clasp around something narrow; they cannot stand or walk on flat surfaces. So this poor hummer could not rest safely anywhere. I was able to capture him in my hand, a tiny, fragile, depleted, trembling creature. I confess I held him a minute or two longer than I needed to, just to soak up the miraculous fact of his being. Then I carried him out to my front garden and watched him soar up into the birch tree. Wow, did he have a story to tell when he got home! And I had a beautiful new gem to add to my Hummingbird jewelry box.